National Hockey League players are now going to think twice before getting physical with fans. Rick Rypien, of the Vancouver Canucks, learned the hard way, after receiving a six game suspension on Friday. 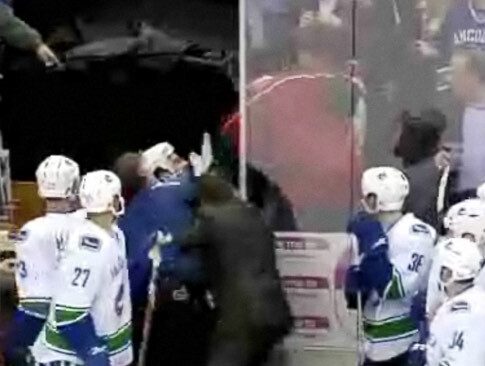 The Canucks were fined $25,000 by the NHL for Rypiens actions. Rypien had fought Brad Staubitz, of the Minnesota Wild, in the first period. The two were about to drop the gloves again but were separated by the referees. Rypien was able to get a punch in. He was then handed a four minute double minor for roughing and a ten minute game misconduct. I am going to have to agree with Malhotra. When a fan gets in your face you have no idea what is going to happen. No matter what Engquists intentions were, Rypien needs to be ready to defend himself. It may have seemed like a overreaction from the replay, but we do not know what words were exchanged or what sparked everything. There have been many different situations similar to this one. Examples would be Ron Artest getting into it with some fans while in Detroit or Lagarette Blount at Boise State. However, I heard rumors that there were some racial slurs that took place in the Blount incident. If that is the case, than I am all for what Blount did. For me at least, I have no problem with someone doing what they need to do when being attacked with a racial slur(s). However, in certain situations there is such thing as overreacting. 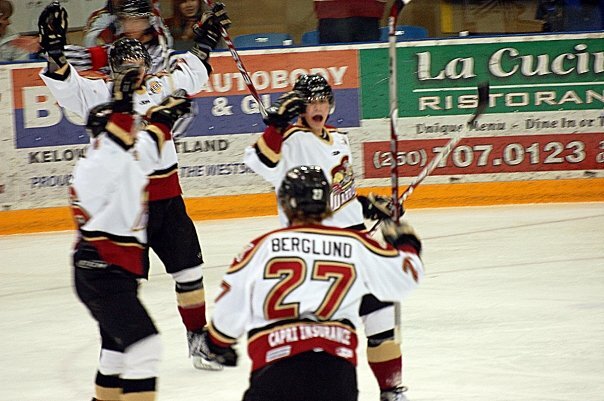 I do not know what sparked Rypien, but some things you just need to let go in one ear and out the other. It is a part of being professional. I cannot say exactly what Rypien did was right or wrong due to lack of information of what happened. Basically I believe that there are certain situations where you do what you need to do and others where you need to be professional. I do not think I will ever know the truth of what happened between Rypien and Engquist. With all the information that I know about the incident, I think that the right actions were taken. Rypien is suspended for the next six games and Engquist was tossed from the facility. There has been the ongoing issue of blind side hits and what the penalty should be for it. The National Hockey League has done its best to eliminate these dangerous hits, by dishing out suspensions and fines. One of the most recent incidents was last week when the Buffalo Sabers played the Chicago Blackhawks. Blackhawks defenseman, Niklas Hjalmarsson, hit Sabers forward, Jason Pominville, from behind. Leaving him with a concussion and 7-8 stitches. If you ask me the play was not clean and the NHL got it right on this one. Every hockey player knows you do not hit someone when you see their numbers facing you. Hjalmarsson was given a five minute major and a game misconduct. After review, he was then handed a two game suspension for the hit. I do believe that Hjalmarsson had no intentions of injuring Pominville. He was trying to make a good defensive play when he read that the puck was coming up the boards to Pominville. Any defenseman that knows the game would have done the same and pinched down. Hjalmarsson unfortunately hit him too early and from behind. His instincts were correct, but he needs to be careful in the future when he is put in the same situation. There have been many issues similar to this one. Last year there was the Mike Richards hit on David Booth, and the Matt Cooke hit on Marc Savard. The NHL is trying to eliminate hits like this from the game. I think they are on the right track, but it is a hard thing to do with a high speed physical game. However, I believe that the NHL needs to take into account all aspects of the situation. A lot of stuff out there is incidental and in the end that is hockey. People are going to get hurt out there. It is understandable what they are trying to do and I totally agree with it. The only thing that I hope does not happen is the league getting softer and to the point where people are too worried about getting a suspension or fine and stop playing physical. I know that the NFL has had similar issues with helmet to helmet hits. I agree that players need to be more careful, but the right discipline needs to take place for certain situations. Both games are moving at high speeds and everything happens so fast out there, so things like this are going to happen. Players do need to be more careful but it is something that is always going to happen. I have had players that turned on me last second when I went to hit them. Things happen, that’s hockey. So NHL please take the right precautions regarding this issue, so the physical aspect does not disappear. However, I believe they are going down the right road right now. Last season, the Leafs were one of the worst teams in the National Hockey League, ending with a 30-38-0-14 record. This season they are off to a hot start (4-0-0-1). No loses in regulation is pretty good if you ask me. Phil Kessel, as expected, is leading the way with five goals and seven points. Also playing strongly is Clarke MacArthur, which comes in as a bit of a surprise. Jean-Sebastian Giguere has been solid in net letting in less than 2 goals against per game. The rest of the Leaf squad has been pretty solid also. All the Leafs have to do is keep the momentum going and gain a decent point lead in the standings. Quick, of the Los Angeles Kings, has been playing phenomenal. He has a .963 save percentage and a 0.97 goals-against average. I mentioned in one of my older posts about the controversy the Los Angeles Kings have in goal between Quick and backup Jonathan Bernier. Right now Quick is showing that this is still his team and job, despite Bernier having the potential to take the job away at any moment. The two Cincinnati Bengal wide receivers were asked about the toughest sports leagues on their television show: T.OCHO. Both of them agreed that the NHL is tougher than the NFL. I would have to agree with them. It is not because of the fighting, but the high speed of the game. Collisions have a lot more impact and you can get crushed into the boards. The NFL also is pretty tough, some of the hits that players take are huge. Coming from these two, it is pretty sweet to have them complement the NHL. That could be because they are my two favorite players in the NFL, but overall I am just stoked about it. 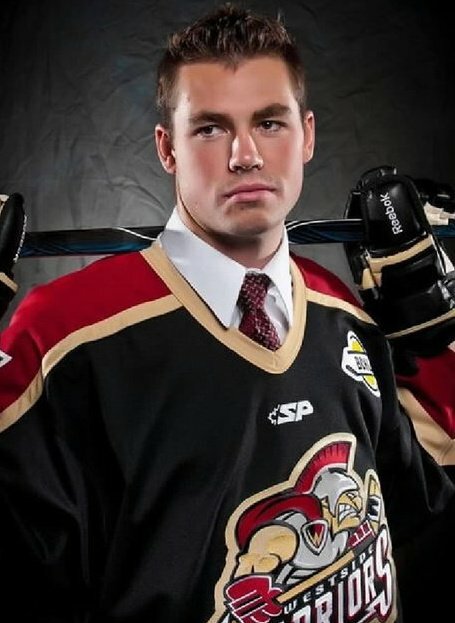 After slipping the the Ducks in the first round to the 12th pick after being projected as a top 5 pick all season, Fowler has proven every team he passed on wrong so far. He is the one bright spot this season on a Anaheim team that has struggled this season. In six games the defenseman has one goal and three points, while also averaging 20 minutes of ice time. The 19 year old is showing that he is capable of playing in the league now. If Anaheim does not keep him after the nine game rule, where rookies can play nine games in the NHL before the club can decide to send them back to juniors, they would be making a mistake. I believe that Fowler is definitely ready, and Anaheim need a defenseman that can quarterback a power play. Los Angeles King's netminder Jonathan Quick, makes a glove save. One of the biggest story lines that will be taking place in the Los Angeles Kings locker room is who is the number one goalie. As of now it is 24-year old Jonathan Quick. As long as Quick keeps playing well his job is safe. According to Murray, Quick is going to be their number one guy to start the season. However, he is going to have to be competing every time he steps in between the pipes. Jonathan Bernier of the Los Angeles Kings makes a blocker save. Highly touted goaltender, Jonathan Bernier just won the back up job after the Kings recently placed Erik Ersberg on waivers today. Ersberg backed up Quick last season. Also not to mention that the club just signed Bernier for another two years. Last season Bernier jumped between the American Hockey League and the National Hockey League. 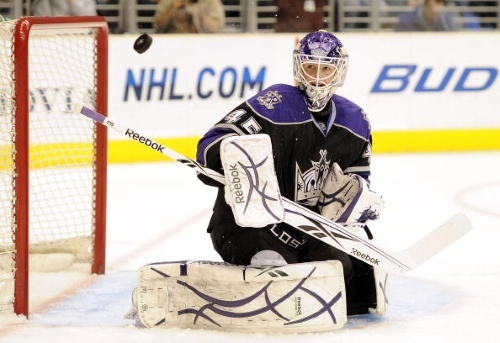 During his time with the Kings he posted 3-0-0 record with a 1.30 goals-against average, a .957 save percentage, which also included a shutout. Pretty impressive statistics if you ask me. Personally I believe the Kings are doing the right thing with Bernier. They are easing him into the starting position, rather than making him jump into the league too fast. A mistake I believe Montreal made with Carey Price, who still can live up to his potential, but has not quite lived up to expectations. Whether it is this season or next season, Bernier will be the starter for the Kings. He is younger (22) than Quick, and has a lot more potential. For the time being, this is good for both goaltenders as they will be competing with each other every time they take the ice. This is the best situation any team can be in when it comes to goaltenders. No matter what, there is not going to be room for both goalies in the future. This means the club should be able to trade one of them and get something good in return. 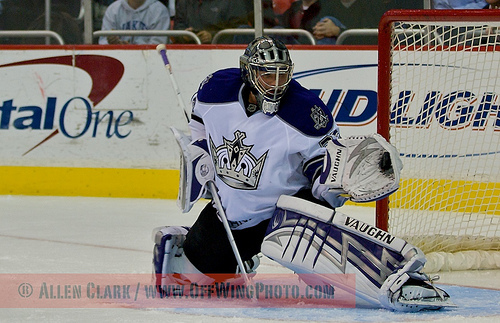 Right now the Kings are doing the right thing, hopefully they can choose the right goaltender when the time comes. 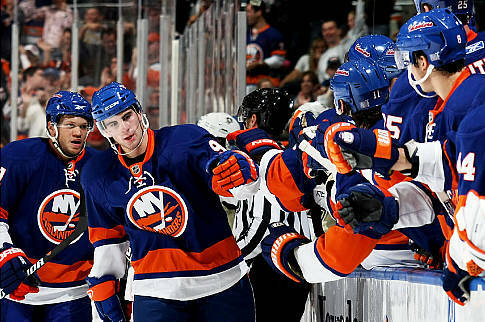 John Taveres of the New York Islanders, highfives teammates after getting his first NHL assist. In some scenarios we see top draft picks not live up to expectations in their rookie seasons or even after a couple seasons. There are many reasons as to why this happens. Some players are called up too soon and may need more development with the junior team or in the minors. Injuries can be another reason for slow starts or the team/coaching style is just not the right fit for a player. Last year we saw former first overall pick, Tampa Bay Lightning’s Steven Stamkos, breakout in his sophomore season. He went from 46 to 95 points, and also finishing with 51 goals in his second season with the Lightning. It was good enough to be a co-winner of the Maurice “Rocket” Richard Trophy, awarded to the leading scorer at the end of the National Hockey League season. 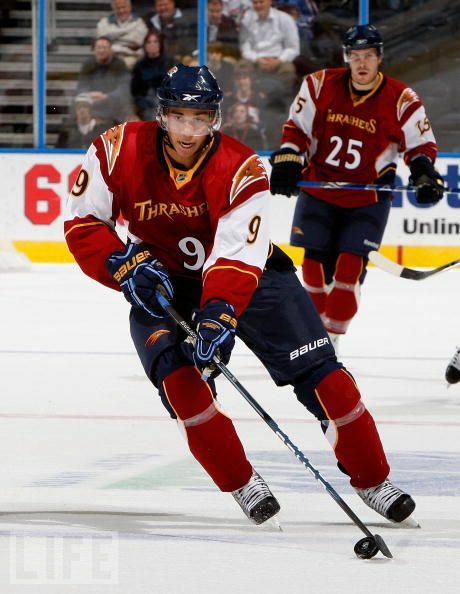 Tavares was the 2009 first overall pick in the NHL Entry Draft. He absolutely dominated the junior level in the Ontario Hockey League, the same league that Stamkos played in. His best season he finished with 135 points in 67 games, which is impressive at any level. During his rookie season Tavares looked like he was going to live up to the expectations that many had for him. However, he finished the second half of the season not as strongly as the first. He ended up with 54 points in 82 games, which was second among rookies. After a year in the league, expect Tavares to make the same kind of improvements as Stamkos. I am not saying he had a terrible rookie season but the way he finished can be considered disappointing to some. Especially after a great start. Tavares is the most likely candidate to do what Stamkos did last season, something that me and ESPN’s Robert Vollman can agree on. Atlantas 2009 4th overall pick should improve his totals this season. Kane has too much potential to have any doubts about him being a 20+ goal scorer this year. With Ilya Kovalchuk gone in New Jersey, expect more ice time for Kane and for his name to be called in key situations. Also do not forget he just turned 19. I will not be surprised to see Kane finish with 50-60 points this season on a weak Atlanta squad. Talk about clutch. When Pavelski’s name was called to be out there in key situations during the 2010 playoffs, he came through. Each of his four seasons in the NHL, he has put up solid numbers despite playing behind the likes of Joe Thornton, Dany Heatley, and Patrick Marleau. After a strong post season, many expect Pavelski to continue his strong play this coming season. Look for him to play more minutes and be out on the ice in key situations. Definitely a guy you want to keep an eye on this year. After two in a half so-so seasons with the Phoenix Coyotes, Mueller was given a fresh start on a young Colorado Avalanche team. Before suffering from a concussion he finished the season with the Avalanche, appearing in 15 games and finishing with 20 points. Last season, Mueller showed that he was a great fit on a young up and coming Avalanche squad. Look for him to play his best season yet. After five seasons in the league, most would consider Brule a bust. His development has been slowed down by injuries, but showed some flashes last year in Edmonton that made him a former 6th overall pick. I still have faith in him and believe that this year he is ready to take his game to the next level. After watching this guy in juniors, it is hard to count this guy out. He is capable to be a consistent point producer in this league. Look for this year in Edmonton for him to find his stride. After all, there is such things as late bloomers.